*This post contains affiliate links for your convenience. If you decide to make a purchase, I will make a commission at no additional cost to you. 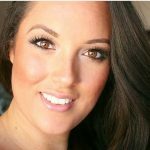 Thank you to Oriental Trading Company for providing complimentary products for this post. 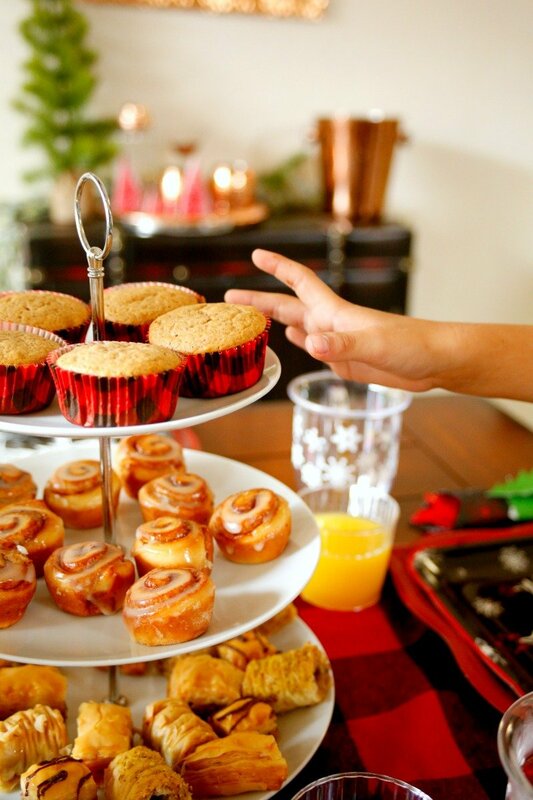 It doesn't get much better than Christmas morning, does it? Were you one of those kids who raced down stairs as soon as the sun was up? Even as a little girl, I loved to sleep in, but not on Christmas morning. And now that I have kids of my own, the magic of Christmas has been reignited! My hope is that Christmas is magical and relaxing for everyone - including us moms. 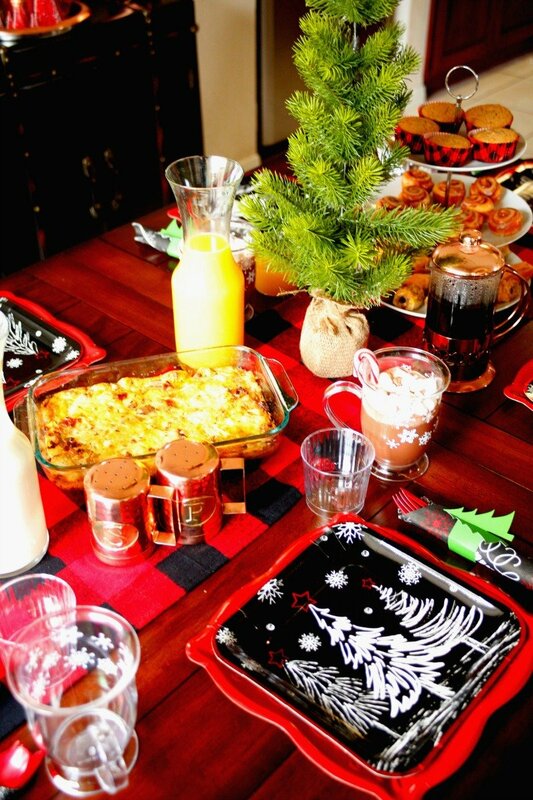 This Christmas morning breakfast is so easy to set up, especially if you prepare the casserole ahead of time. Plus cleanup is a breeze when you're using disposable plates, cups and utensils. 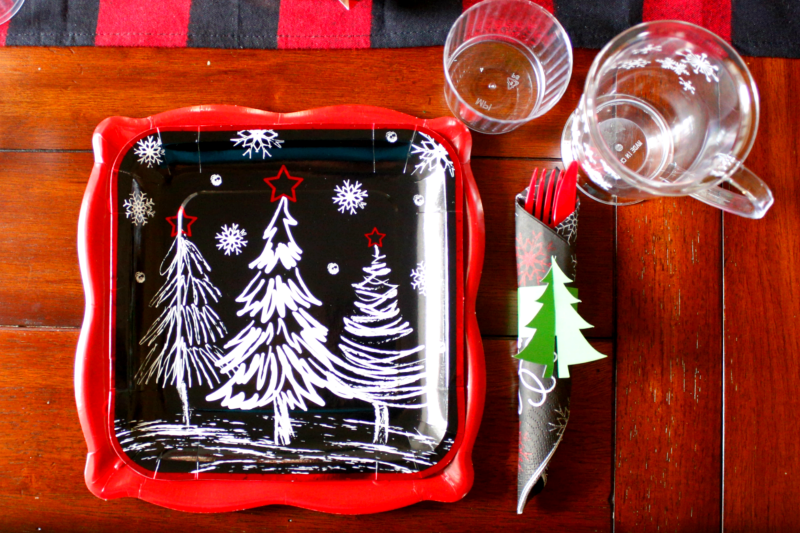 Have you seen how nice paper plates have gotten lately? They are a great way to customize your event, are cost effective, and you don't have to worry about taking up too much storage space. I've become somewhat of a party supply hoarder! 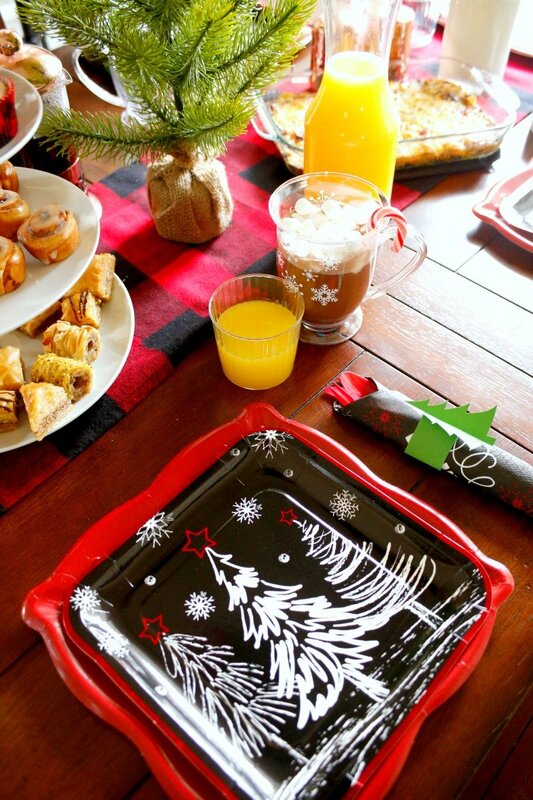 I got these adorable Christmas tree plates and red scalloped edge paper plates from Oriental Trading Company, as well as the matching napkins. Even though the items from Oriental Trading Company were complimentary to me as a brand ambassador, I got to hand pick everything that I wanted. They have so many awesome things to choose from, that I had a hard time narrowing down my decision. I had already decided to go with a buffalo check plaid theme for my kitchen this Christmas, so I wanted items that would coordinate. I had to have this buffalo plaid table runner and was super excited about the table top Christmas trees. 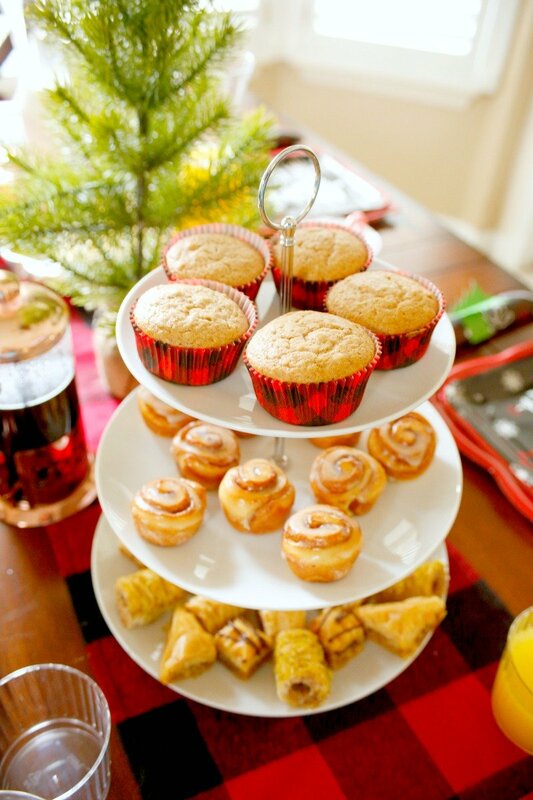 For this breakfast I used a muffin mix to whip up these banana nut muffins in no time and baked them in buffalo plaid cupcake liners that are also from Oriental Trading. And to make things really easy, I picked up a pack of mini cinnamon rolls and a box of baklava from Costco. They went surprisingly well with the egg and sausage casserole. 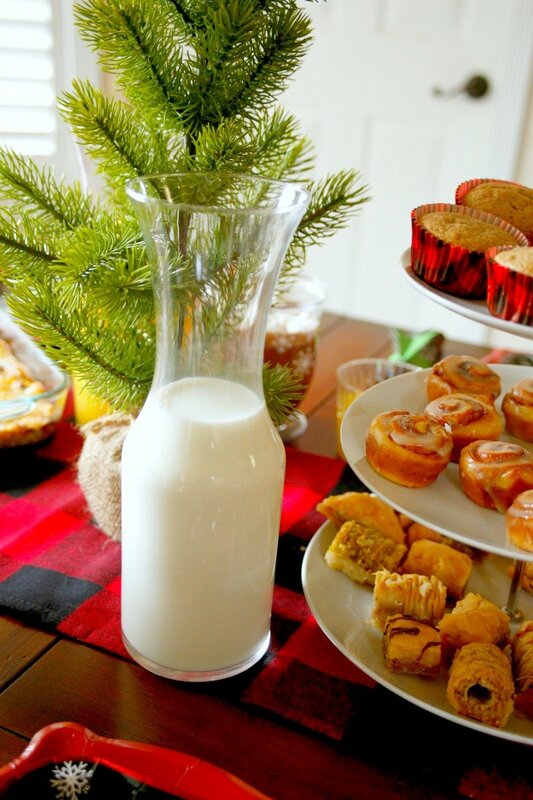 I also put milk and orange juice into carafes to put on the table to limit the amount of times I would need to get up. If you have little kids, have you ever made it through an entire meal without having to get up to get someone something? "Mom, can I have more juice?" "Mom, I want more ketchup!" "Mom, I just spilled my whole bowl of spaghetti on the floor!" Surprisingly, I only had to get up once during this breakfast! My boys are obsessed with hot chocolate. 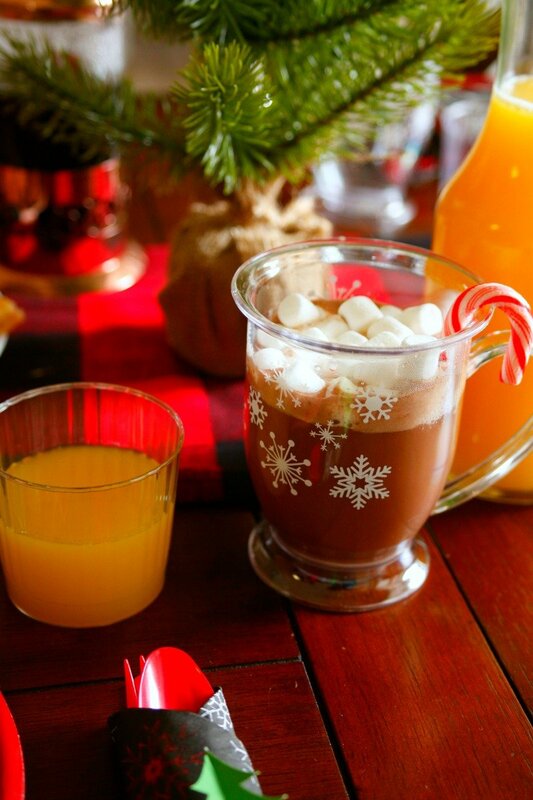 I wanted to make it extra special with mini marshmallows and candy canes. When I picked out these plastic mugs from Oriental Trading, I had thought they were disposable too. They are made of plastic but are really sturdy and just adorable! I'll be using them on my hot chocolate bar coming up later this week. 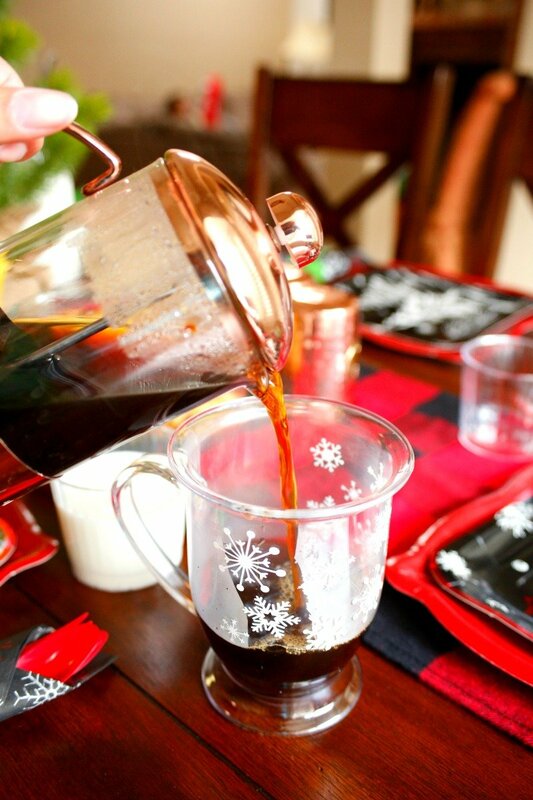 The kids had hot chocolate, but it was coffee for me! My oldest son really liked the muffins. I wish it was Christmas time more often. I seriously would love it if we lived in a world where October thru December was on constant repeat! I'm still finishing up my Christmas decorating but you can see the Christmas door swag I made in the background. Like this post? 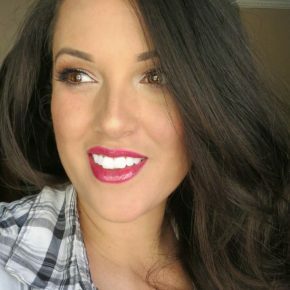 Stay up to date on other fun ideas and sign up for my newsletter! And you may have noticed those cute little Christmas tree napkin rings. I made those with my Cricut Maker. I'm pretty obsessed with making napkin rings when I use plastic cutlery. 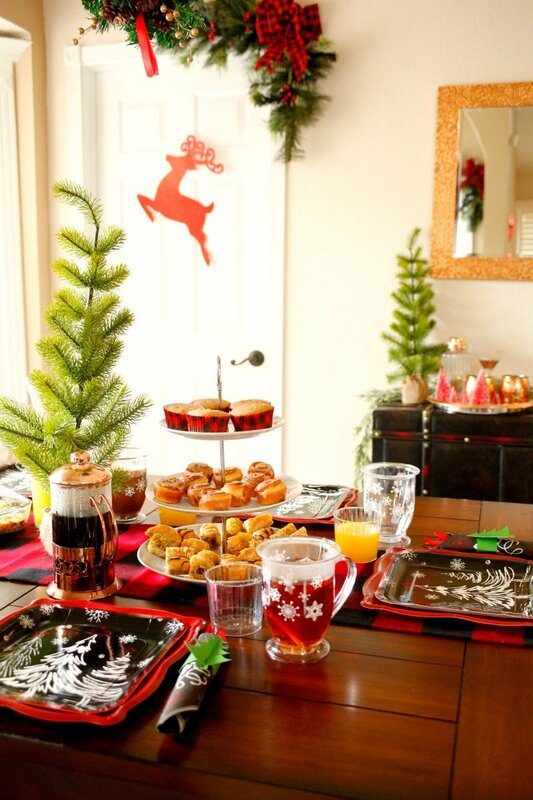 But again, I have a festive table and minimal cleanup when breakfast is over. 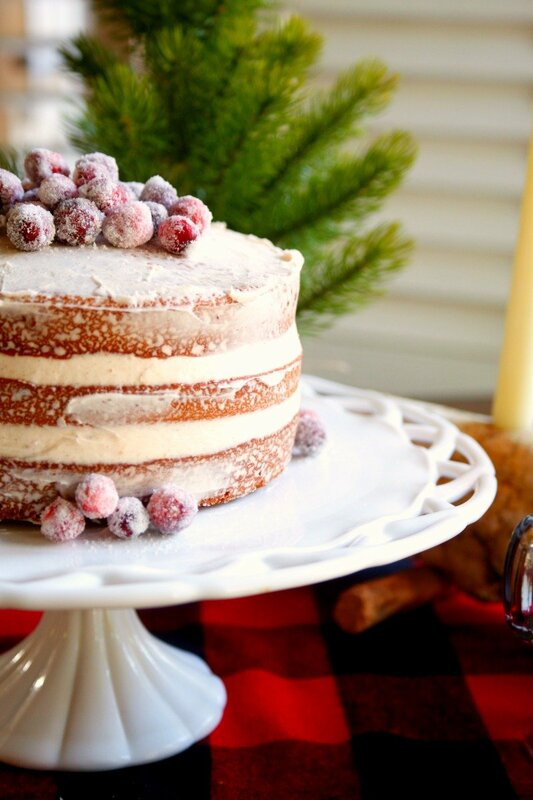 Who wants to deal with a bunch of dishes on Christmas morning? Not me! The presents are opened, the kids are happy, the stores are closed and the rest of the day is for enjoying the family. 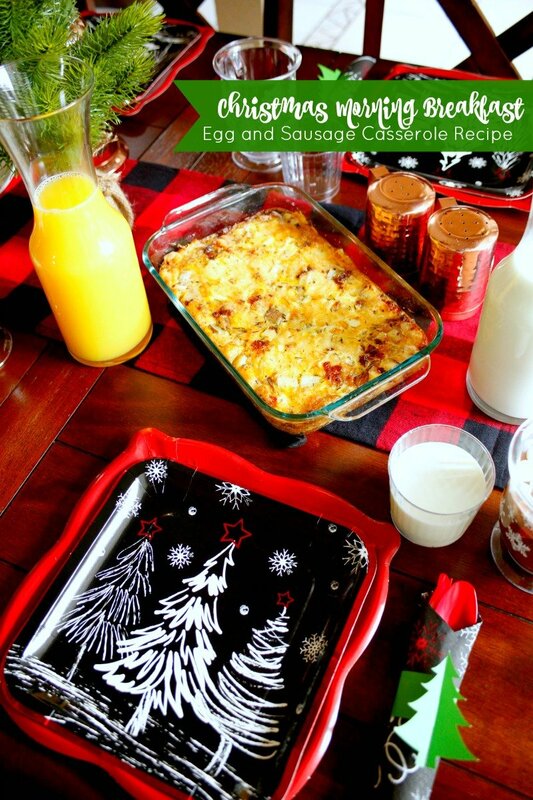 Of course this egg and sausage breakfast casserole is not just for Christmas morning - you can make it any time of year! Wishing you and your's a very Merry Christmas! Grease a casserole dish and preheat your oven to 350 degrees. Cook the sausage in a skillet until browned. Whisk the eggs together with the oregano, salt, and pepper. Add the sausage and potato to the bottom of the casserole dish. 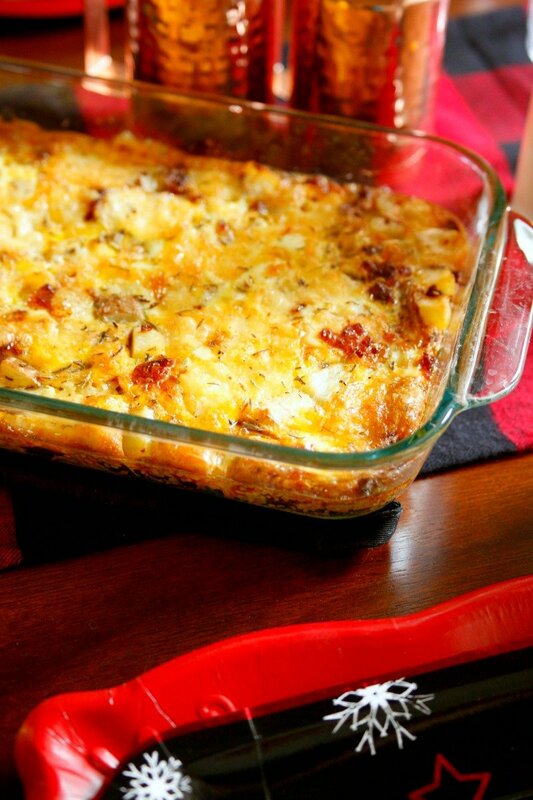 Top with cheese and the whisked eggs. If preparing ahead of time, cover with plastic wrap in refrigerate until ready to bake. Otherwise, bake for 20-35 minutes or until eggs are set. P.s. 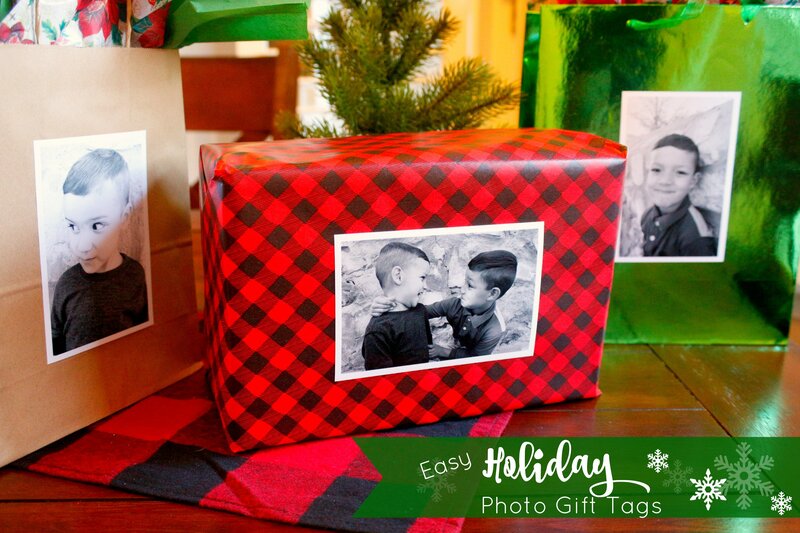 If you need more Christmasy Buffalo Plaid goodness check out these posts too!